LOCATION: The tundra biome is the coldest of all biomes. It is also quite big. The tundra covers about one fifth of the land on earth. The word tundra comes from a Finnish word that means treeless plain, which is a good description of the biome. Tundra biome is located in the artic circle, which is a circle that surrounds the north pole, but this is not the only place we can find freezing cold temperatures and a few animals. In Antarctica, and other cold environments, there are areas that can be described as part of a tundra biome as well. WEATHER: The tundra is the coldest and the driest of all the biomes on Earth. There is very little rainfall in the tundra; it rains less than ten inches a year. Winters here are long, and summers short, sometimes they last for only 6 - 10 weeks. In the winter the temperature can reach -50°F (-45.5°C). And we think our winters are bad! Because the tundra is so close to the north pole, summer days are 24 hours long! Summer temperatures rarely get above 50°F (10°C), just enough to thaw the surface of the ground. What a place for a summer vacation! In the summer the soil becomes very soggy from melted snow and rain. The moisture sinks into the ground, which is called permafrost. The permafrost lies six inches below the ground, and is frozen for most of the year. The top layer of the permafrost thaws, but the bottom layer of gravel and finer material stays frozen all year which keeps moisture from rain on the surface of the ground. PLANTS: You would think that plants would never live or survive in this biome, but the answer is quite a surprise. There is low diversity in organisms that live here, but many still flourish. Many lichens, mosses, and small shrubs flourish in the arctic tundra. The plants that live in the harsh permafrost soil usually adapt to the weather by being short and grouped together to resist winds and to be protected. The growing season in the tundra is short and lasts up to 60 days. Tundra plants get their energy from the sun through photosynthesis like all other plants, but have adapted to low temperatures and low light intensities. Compared to plants in other biomes they use a minimal amount of energy. ANIMALS: You may think that the tundra is too chilly for animals, but guess what - it’s not. There are actually animals that live in this harsh biome! You might find lemmings, caribou, and arctic hares in the tundra. These animals seem pretty nice, but can you guess which the largest and most dangerous animal is that lives in the tundra? THE POLAR BEAR. Polar bears love to eat fresh, fatty meat. Fatty foods might not be good for humans, but polar bears need the energy from fat to survive the cold tundra. Seals, at times walrus, and sometimes even belugas trapped in open water pockets surrounded by ice are some of the polar bear’s favorite meals. They will also eat berries and eggs in the summer. Polar bears hunt by the power of scent and can smell their food at 20 miles (32 km) away. The stomach of an adult polar bear is so big that it can hold more than 150 pounds (68 kilos) of food! Other predators of the tundra are arctic foxes and wolves. Some migratory birds also live in the tundra during part of the year. Animals who live in the tundra have special adaptations to survive. Some animals in the tundra are adapted to the climate by breeding and raising their young in the summer. Many animals hibernate, or sleep during the worst part of winter to minimize energy loss. Because animals of the tundra are generally migratory, this biome's population is constantly changing. Resident animals have to change what they are hunting and eating as the seasons change. The food chain in the Arctic Tundra consists of predators such as owls, foxes, wolves, and polar bears at the top of the chain. 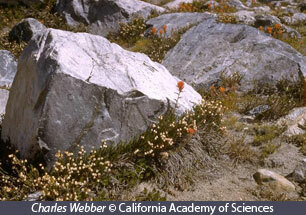 Predators hunt herbivores, plant eating animals, such as caribou, lemmings, and hares. Mosquitoes, flies, moths, grasshoppers, arctic bumblebees, and other insects are at the bottom of the arctic food chain. Many birds feed on these insects. PEOPLE AND THIS BIOME: The tundra may seem tough, but it is a very sensitive environment. More people have recently been moving to the tundra to work in the mines and oil industry. New towns and roads are being built to support the increased population. Developments have interrupted many of the animals’ migrations and feeding patterns, as well as caused damage to the permafrost. It takes so long for the tundra to recover that tire tracks and footprints remain on the ground for decades after they were made. In areas of the tundra there are also many natural resources, such as oil. People worry that pollution from these mines and rigs may ruin the fragile ecosystem. 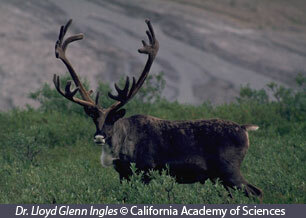 A caribou migration route was interrupted by construction of the Alaskan oil pipeline. In some places the pipeline has been raised high enough above the ground for caribou to pass under it. Insects bombard the tundra in the summer and birds flock there to eat them. Pesticides used to control insects may work their way up through the food chain and affect many of the animals that live on the tundra. We need to be careful with the delicate tundra environment. There is also much we can learn from the tundra. Permafrost has the ability to preserve plants and animals in the cold ice for long periods of time. Scientists can use the permafrost as a record of the past to learn about climate. These records are a tool to compare past climates with the current climate to see how much the earth may be warming. As we learn more about this unique biome, it is important that we continue to care for it.